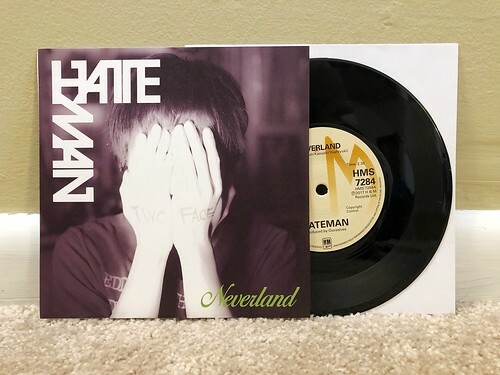 I Buy Way Too Many Records Dot Com: Hateman - Neverland 7"
Hateman is one of my favorite discoveries from Japan in the last few years. I absolutely loved their 2018 full length Radio Hate and I have been on the lookout for anything else I could get my hands on. Luckily I was able to grab this two song 7" from the Waterslide records distro. I had pretty high expectations going into this 7", considering how great their last album was. I'm happy to say those expectations were met and both songs are outstanding. I still think Hateman remind me a little bit of the band Popcatcher as both bands are masters of crafting ultra catchy vocal melodies with the sort of backing harmonies that never cease to get lodged in my brain. A side "Neverland" is built off of minimal, jangly guitar in the verse, with the bass driving the majority song. When we hit the chorus, the guitars get a little bit louder and the backing vocals soar. It's so great. On the B side we have "Boys Keep Out Tonight" which is my favorite of the two. It's a little bit faster and the guitars are more in the forefront, but again the strength of the band is how great the vocals are. It's impossible to not sing along to "boys, boys, boy" and "girls, girls, girls" for about seven hours after listening to this. It's just that damn catchy.